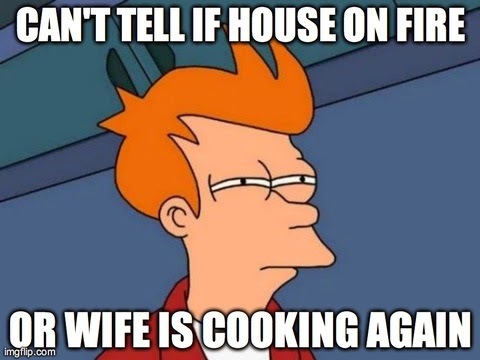 A few weeks ago, my husband and I spent the weekend at my mother-in-law's (MIL) house. My MIL is like Martha Stewart (only she didn't go to jail) - she is an inspiration to young women like myself who lack the natural ability to cook, sew and be creative (amongst many other woman-like skills). That weekend, we watched Julie & Julia; my new all-time-favorite movie about a writer/wife/young woman named Julie Powell (Amy Adams) who cooks and blogs her way through Julia Child's (Meryl Streep) french cook book; 524 recipes in 365 days. That's a lot of cooking! But, I left my MIL's house convinced that I should start a blog and write about running (the only real thing I know how to do lately) and all things domesticated that I'd like to learn. People who know me, know that I struggle in the kitchen (and other parts of life that I'd like to avoid admitting so early on). I have been known to confuse Tbsp with tsp (which does not make for a tasty pumpkin cake) and I have washed dishes with a basting brush (I'll have to share that story another time); my idea of "cooking" was once microwave broccoli, chicken strips with lemon pepper seasoning and Pasta Sides on the stovetop. In the last several years I have enjoyed much tastier meals - a few cooked by myself and many others cooked by my husband (who inherited his mother's culinary wonderfulness) and my father (who is the master of all cooking in my household growing up). I am like my mother in the kitchen, I have one really good dish that I only cook once a year. been known to turn on a fire alarm or two.